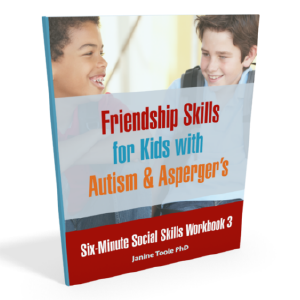 Making friends and maintaining friendships is a struggle for learners with Autism, Asperger’s and similar social skills challenges. 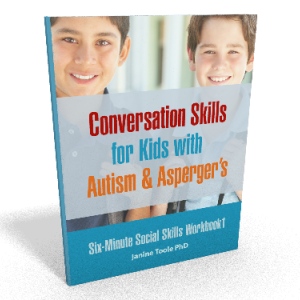 Often these children lack the conversation skills needed to communicate and engage with their peers. 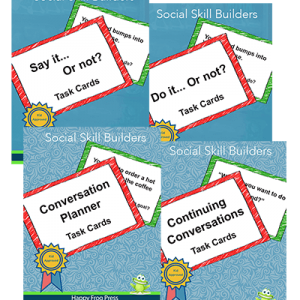 This hands-on manual is your step-by-step guide to helping your learner build strong conversation skills. Get the PDF here or purchase it in print/Kindle on Amazon. 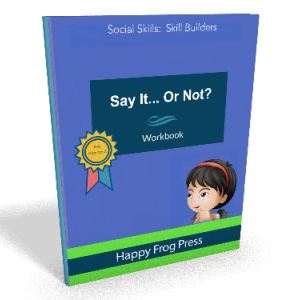 Weekly social skills lessons emphasize the entire spectrum of skill acquisition, from structured practice to generalization in the natural environment. 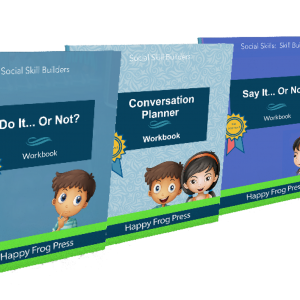 Lessons are scripted for easy delivery and all required materials are included, making this resource suitable for both parents and professionals. Begin a conversation by asking about their friend’s interests. Respond to a friend with appropriate comments, follow-up questions, and follow-up comments. 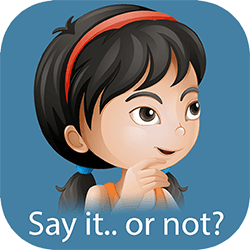 Track the movement of a conversation topic and avoid getting stuck on his/her own special interest topic. Appropriately change a topic during a conversation without dropping it in like a bomb. Signal interest with eye contact and body orientation and also interpret a friend’s face/body messages. Begin and end a conversation smoothly. Children learn and practice these key social skills while playing games, doing crafts and hanging out with their friends or family. The focus is on extended practice to ensure mastery. The manual is organized into two parts. 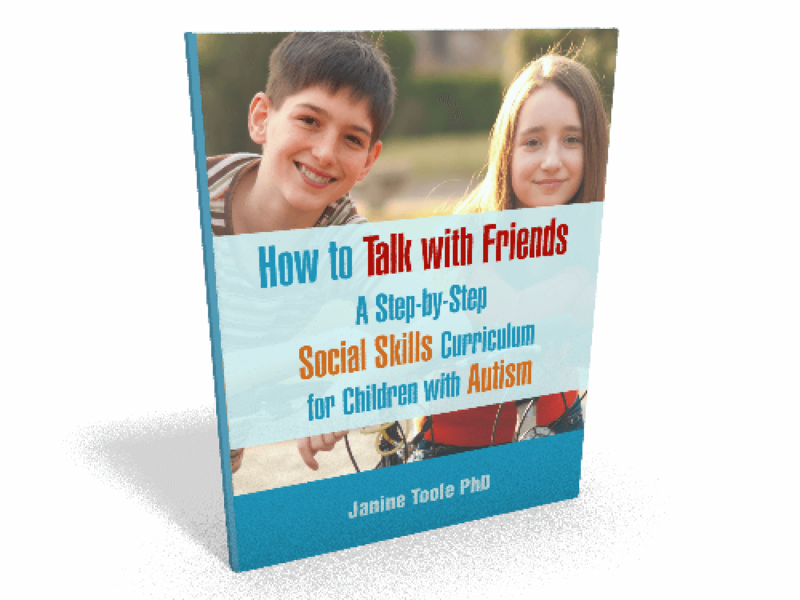 Part 1 provides the background information you need to run a successful social skills group or teach an individual learner. Individual chapters cover the course content and structure, preparation, and course delivery and assessment. Part 2 contains weekly lessons. Each lesson provides step-by-step instructions for pre-session preparation, session delivery and assessment, and parent communication. The social skills lesson is scripted to ensure high-quality delivery even with inexperienced coaches. All materials for delivering the course are contained in the Appendices. 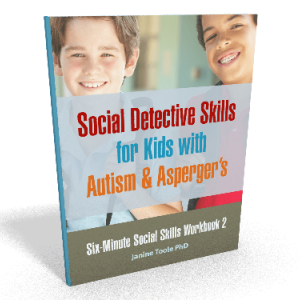 Children with ASD can learn to engage with peers. This easy-to-use manual is the guide you need to ensure their success.